Why getting kids to interact intentionally isn’t touchy feely, it’s critically needed. I once had the honor of hearing Dr. Tim Elmore speak and was astonished when he shared, “The average teenager today has as much anxiety as the average psychiatric patient in the 1950s.” At first I didn’t believe it, but then I started to think about my experiences the past 15 years in education and how I have seen an increase in anxiety in the students I served. The danger is that when anxiety goes up, empathy goes down. We can put metal detectors and increase police presence in schools to address a problem, but if we don’t put a focus on strengthening relationships and teaching strong character and social emotional skills, we will never get to the root of that problem. Too many times I have heard statements from educators that believe you can’t have both high expectations and high supports at the same time. “I don’t smile until the winter holiday and then I slowly ease up,” as if to say the only way to be successful in teaching is to be really hard on your students and not connect personally for a certain amount of time. “I am best friends with my students,” yet when asked more specific questions you learn that students aren’t necessarily being held accountable or held to high expectations daily, as if to say that it’s only about being positive and fun as an educator. I still remember being a first year teacher, and during my plan period, a veteran teacher taught in the same classroom I would prep in. I remember a 12th grade student in this psychology class breaking down during a discussion and explaining that she thought she had it great because her mom was her best friend and let her do whatever she wanted. Her mom would let her host parties and even would party with her and her friends at times. The girl explained that it was wonderful until she needed her mom to be her mom. When she needed true support, her mom just wanted to be her friend. I believe the true key to success is to be both tough and tender. Hold students to high expectations and be relentless in your approach, but also get to know your students, connect one-on-one, and give students the opportunity to connect with each other. Create a classroom and school environment where students feel paid attention to and appreciated, but also that you believe in their potential. Don’t be confused, tough love is also relational work! Students will thank you for it, even if they don’t verbalize it to you while in your class. We were introduced to a business community that had come together to talk about the issues they were seeing from students coming to them right out of high school, certificated programs, and/or colleges. They discussed how many of them did not have the basic people and character skills to be successful in their organizations. They often had solid technical skills, but lacked the ability to communicate with team members and customers, self-motivate, actively listen, or be disciplined enough to set deadlines and get work done. These business leaders realized that they were spending millions of dollars collectively teaching adults relational and character skills needed to be successful in their business or organization. They realized that these “soft skills” were the new “hard skills” and were committed to helping bring the work of developing these soft skills to 26 school districts across their area to help curb this problem and ultimately create a better upcoming workforce, community, and world. You can read about it here. CharacterStrong provides educator trainings all over the United States and even abroad. 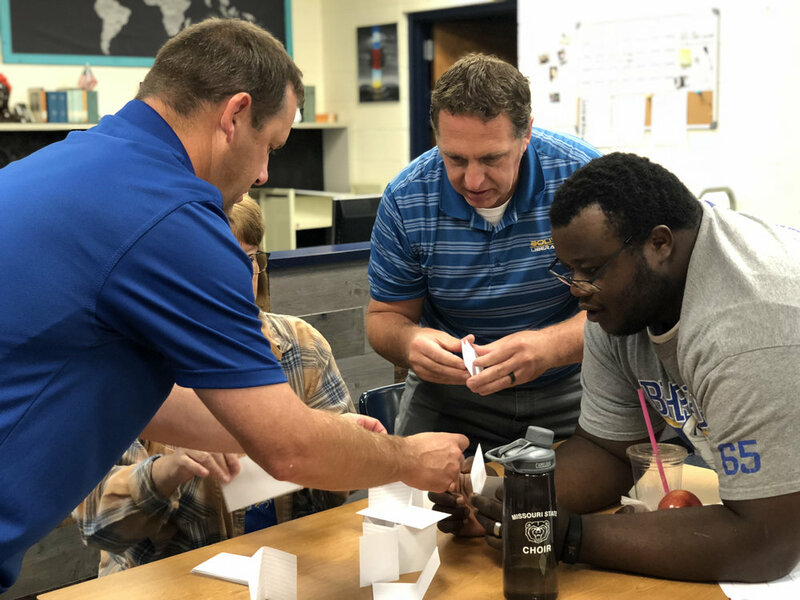 We get to see firsthand the power of working with educators on why they do what they do and practical strategies on how they can infuse character development and social emotional learning into the daily fabric of their classrooms and schools. We have also seen the power of what happens when educators in a school intentionally put a focus on relationships with each other and how that translates into better serving students each day. I remember speaking with an educator from a school who had experienced powerful results from intentionally implementing our CharacterStrong curriculum as well as having staff go through our CharacterStrong training. He said, “The work we do as teachers is not easy, but for whatever reason this year it hasn’t felt like work. I actually look forward to coming to work each day!” When asked why he thought that was the case, he said the two things that stood out was 1) having a common language as a staff with the work of teaching character and social emotional learning to all their students, and 2) the focus on building relationships with each other as a staff. These are powerful words in today’s school and classroom. Many times the term “touchy feely” from a staff member is a result of being uncomfortable teaching something that they aren’t use to teaching. This does not make it any less important to teach, but it does mean that we need to support our teachers and give them opportunities to experience it firsthand and learn how to teach it. With our CharacterStrong curriculum, we were very intentional about having teachers who were actually in the classroom help us be content editors. We knew that the lessons needed to be built by teachers for teachers and easy to implement. You can see some sample lessons here. In the book Character Compass by Scott Seider, he talks about how different schools and districts have approached the work of teaching character development to their students. At the beginning of the book he quotes Howard Gardner, professor of education at Harvard. Dr. Gardner said if you look at the last thirty years in our country there have been many situations where thousands, if not tens of thousands of people, were impacted in a negative way because of a lack of character decision making by people in positions of leadership. Gardner states that negative character decisions were made by our “best and brightest,” and in many cases, Ivy League students. Who needs character development? The answer is everyone! So what are we going to do to make sure that all of our students receive a consistent and viable curriculum, not just for their academics, but also their character and emotional intelligence? We are interested in hearing about what your school is doing to make the teaching of relational skills and character development relevant and important. Let us know what approaches you are taking. You can learn more about what CharacterStrong is doing to support schools in this area by clicking here. About the Author: John Norlin is a co-founder of CharacterStrong, a Servant Leadership trainer, and motivational speaker. He was Washington Advisor of the Year, taught 5 leadership classes per semester for 10 years at Sumner High School, and was a Program Administrator for the Whole Child for five years.